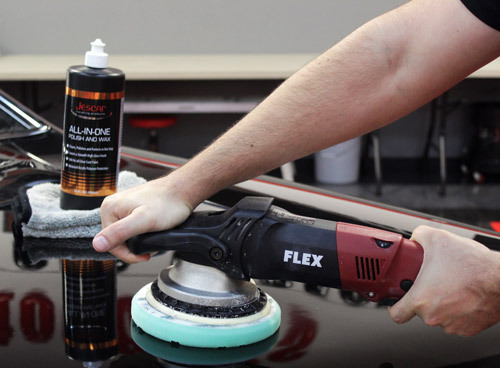 Scratch removal, increased depth, and long lasting protection – in one! Jescar All-In-One Polish & Wax is what you get when you take the swirls and scratch removing action from the Jescar Correcting Compound and the depth-increasing power of the Jescar Micro Finishing Polish and top it all off with a long lasting paint protection! Jescar All-In-One Polish & Wax will clean, polish, and protect your paint in just one step and is safe for use on all clear-coat paint. Jescar All-In-One Polish & wax can be used alone, or as a second (and technically, third! ), after using Jescar Correcting Compound! While we all enjoy the multi-step process of paint correction, polishing, and protecting, there’s just something about an all-in-one product that is so satisfying – especially when you’re using a quality product, like Jescar All-In-One Polish & Wax. That’s probably because you can achieve almost identical results in just one step, instead of three! Jescar All-In-One Polish & Wax does just what the name implies – it corrects, polishes, and waxes without having to switch bottles! Jescar All-In-One Polish & Wax will correct light swirls, polish paint to perfect, and leave behind a layer of protection – all in one step! When Jescar released their Correcting Compound and Micro Finishing Polish, they blew everyone away with their advanced abrasive technology and the products’ ability to work well on removing swirls and scratches together. With their new Jescar All-In-One Polish & Wax, both professional detailers and enthusiasts alike will be able to accomplish both of the things the Correcting Compound and Micro Finishing Polish provide, along with a long-lasting protection, in just one step! Jescar All-In-One Polish & Wax can be used with dual action or rotary polishers, and works best with a light cutting and polishing, or AIO pad. Keep the complications of paint correction to a minimum with Jescar All-In-One Polish & Wax. Shake well before using. Do not work on hot surface or in direct sunlight. Apply Jescar All-In-One evenly and completely over the surface of a foam polishing pad, then spread over area to be polished before starting the machine. .
Polish using medium pressure and speed over a 2 x 2 sq. ft area, moving up and down and side to side while the polish breaks down leaving a clear film on the surface. Wipe off residue using a clean microfiber buffing towel.